The Department of Energy oversees the national laboratory system, one their programs, LDRD, allows scientists to apply for additional funding to pursue additional projects. Every national lab oversees their own LDRD programs; unfortunately the one run by Argonne National Laboratory was a mess. Their internal LDRD website was maintained by an admin who read an HTML book and never organized their information. I was brought in to work on this project and fix it. 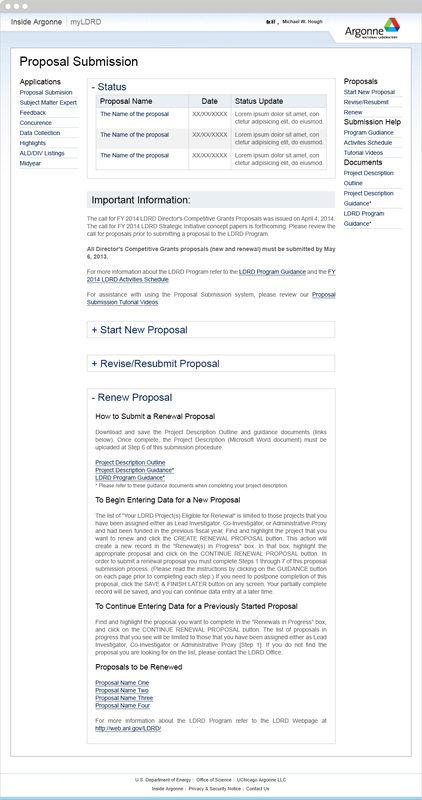 It was my job to review & organize the information while trying to promote the LDRD sign up to encourage scientists to apply for more grants. To complicate matters I did this project in autumn of 2013, six weeks before the government shutdown. If I didn’t finish the project in time they would not have the budget to pay me. I know that you consulted with us for only a couple of weeks last year, but I wanted to let you know that we have gone live with our redesigned home page that was based off of your designs. We have also incorporated your “look and feel” into a couple of our other web applications. I wish there were a way that we could show you the outcome. I am very pleased with the results and want to thank you again for the wonderful design that you provided for us. I think that our website is now relevant to our computing era. We have come a long way in a short couple of months, and I am glad that we had your assistance in modernizing our web space. Thanks again for working with us to come up with a cohesive design that we are able to incorporate to all of all web systems. I spent a week exploring their current site, taking notes and slowly organizing the information into something cohesive. I put together a sitemap and tried to present them to the LDRD administrator, unfortunately he did not understand site maps. He was a 70 year physicist who was stuck in his ways. I went back and reorganized my site map into an outline; I used the Roman numerals as the primary navigation, the Alphabet as the secondary and the numbers as the tertiary navigation. Once I presented him with this format he understood and signed off. Once I had his approval on the site map I proceeded to pencil sketches and wireframes. The majority of the pages were a series of rules, stories, document downloads, etc., therefore most of those page looked very similar. For this project I realized the home page was going to be key to grabbing the user’s attention. The original design was so confusing that users did not know how to use it. 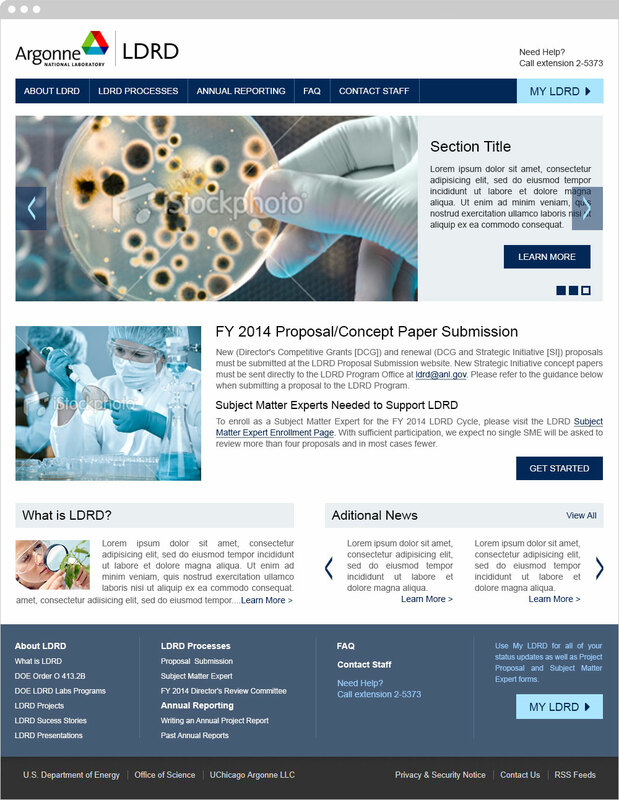 If you look at the main navigation the MY LDRD link is highlighted against the navy background, MY LDRD is where a scientist goes to sign up for a possible grant and project funding. The rest of the page is different news sections. 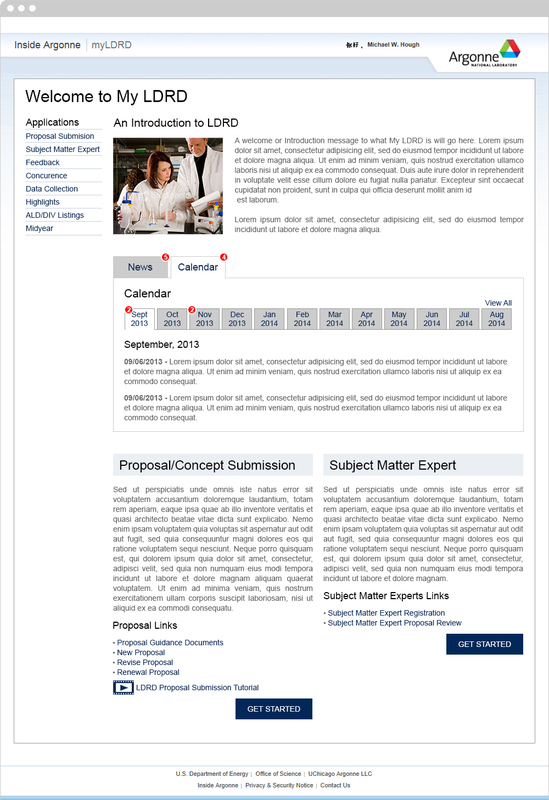 The majority of the internal or sub pages followed the same template throughout; a clear page title, a left side sub navigation and content on the right. I used light blue as a way to help divide the different page sections. Unfortunately, Argonne did not have much of a stock photography budget nor did they have an image library. Most of the pages were just copy, but my e-commerce background taught me to always try to convert. I added a GET STARTED button on almost every page as a way to bring attention to the sign up process. One of the biggest user complaints was the inability to find Argonne’s LDRD staff contact information. I created their first contact page. The guy in the photo(s) was my boss on the project and he loved that picture so I thought it would be fun to add. 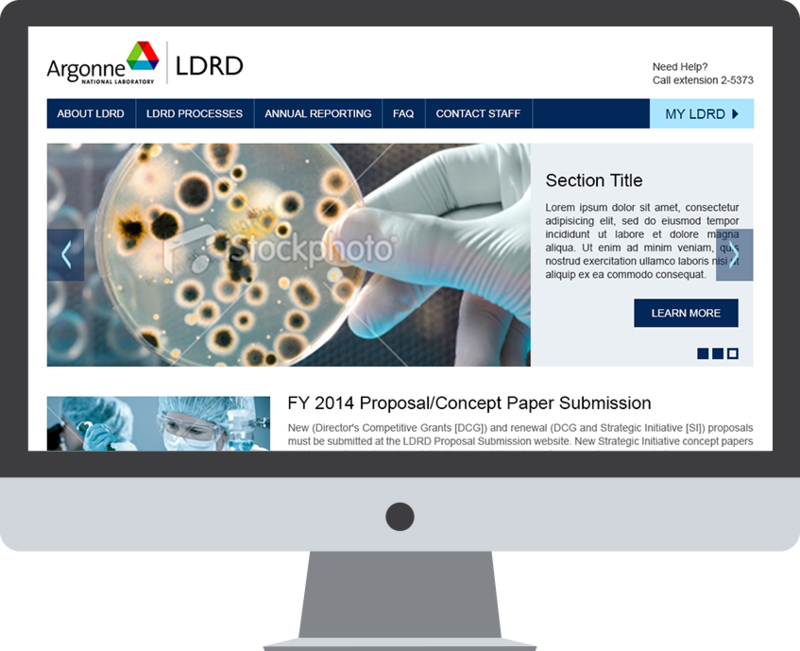 On the previous pages I was given a lot creative freedom to design them in a style I liked, however in the MY LDRD section these pages had to follow Argonne’s intranet standards. 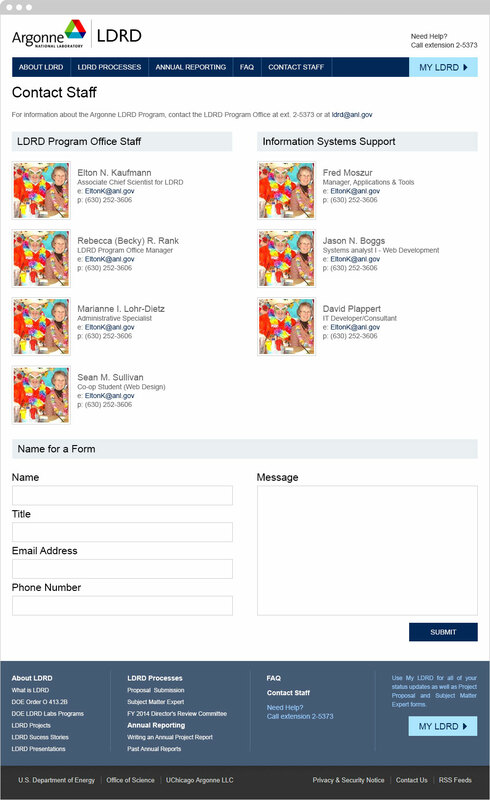 My job on these pages was to try to organize the information better and get users to sign up. 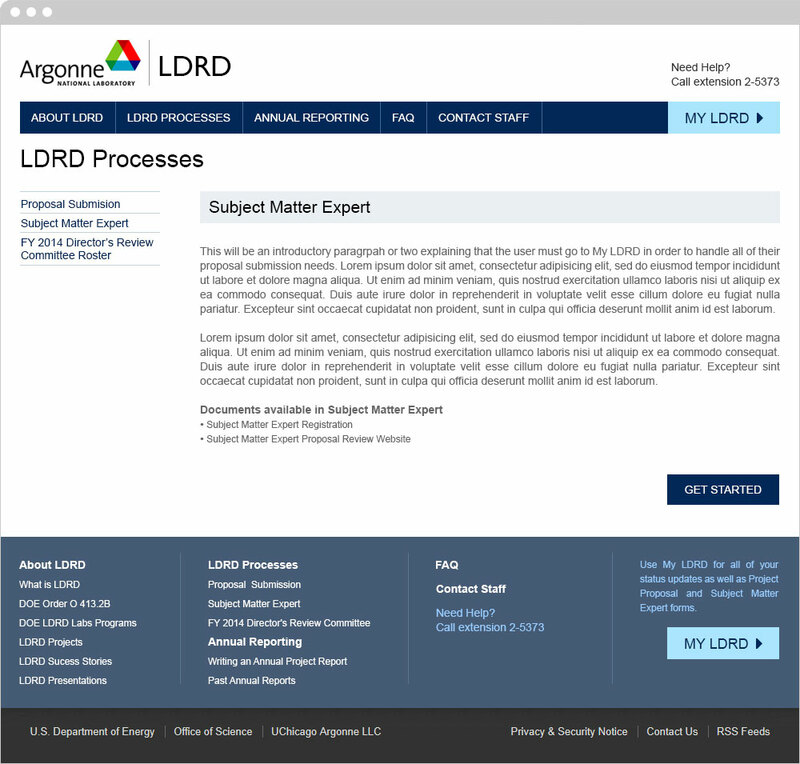 In LDRD there are two areas where Argonne wanted users to sign up, proposals and subject matter expert. As discussed earlier the proposals are grant applications but the subject matter experts are the equivalent of peer reviews. These are the individuals who review the experiments and help to go over the data to come to a consensus. Argonne’s intranet at the time had their primary navigation on the left side of the page and the sub navigations on the right. I was locked into this design. I reorganized the content. The only parts of the page highlighted are the news, calendar that contains important dates for the LDRD process and the GET STARTED buttons at the bottom of the page. 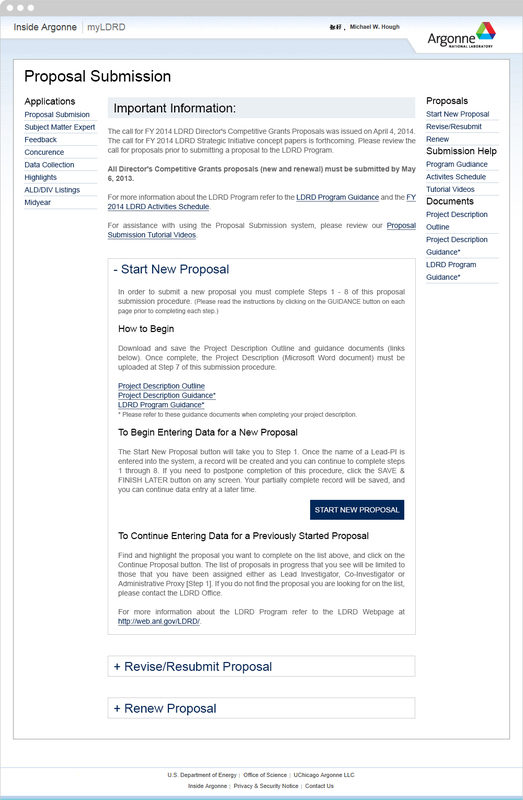 The calendar shows a month to month series of upcoming events around the LDRD process. 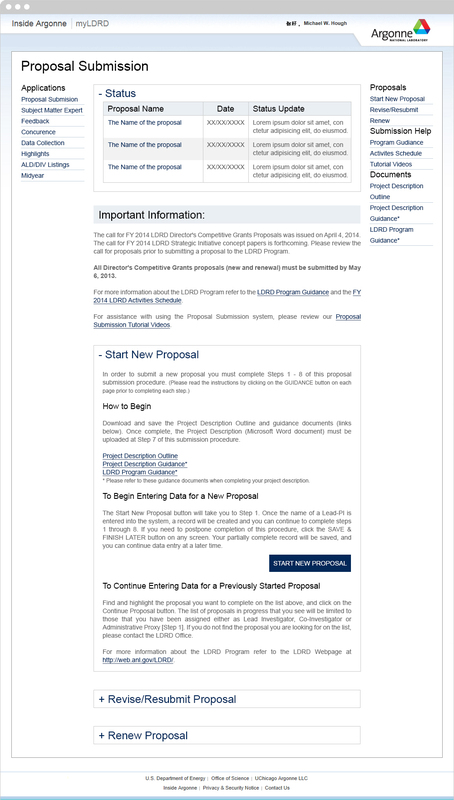 This is the page a user sees when they are ready to put together a proposal. 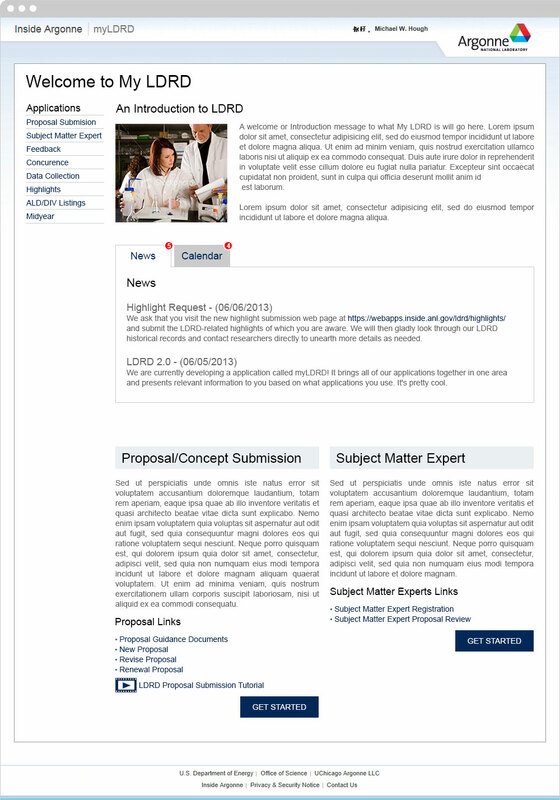 It has all the links and documents they need in order to create a proposal. Unfortunately due to time constraints I was not in a position to convert the documents to a series of forms for a better experience. When I originally viewed the page the amount of information was overwhelming and difficult to see, my solution was to divide up the page and put the information into a series of expandable sections. This was well received by the LDRD department. After a proposal has been submitted whenever a user comes back to this page they can view the status of their proposal(s). Expanded view showing steps to revise a proposal that needs editing. 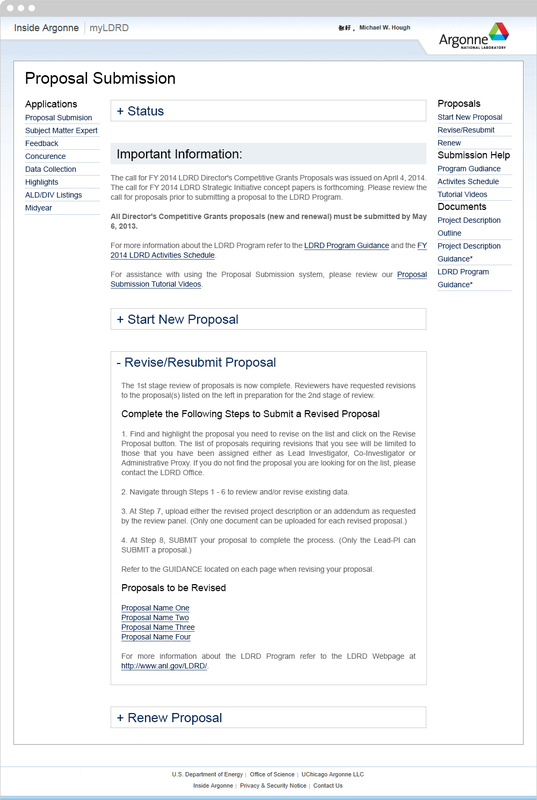 Expanded view showing how a user can renew an existing proposal. After a proposal has been submitted the Welcome page has a slightly different view. 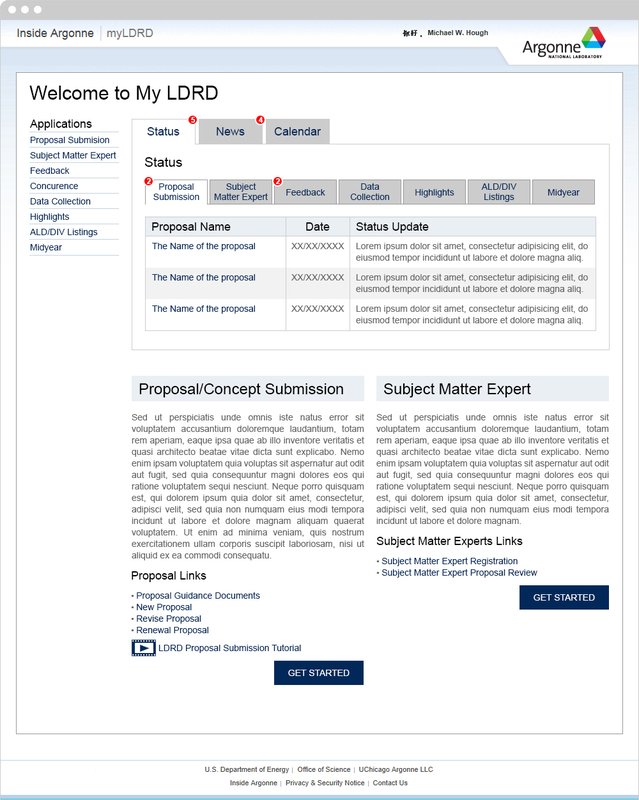 The introductory paragraph is now gone as the user no longer needs to be sold on LDRD, they are now given the status of their project submission.